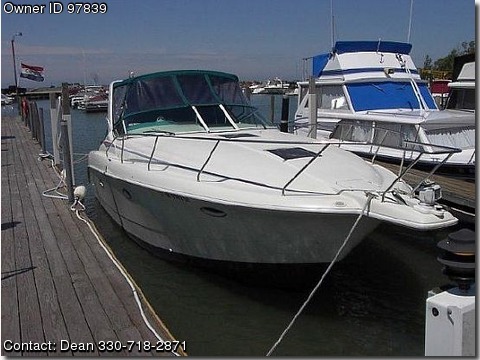 Please contact the owner directly @ 330-718-2871 or deanmassaro@hotmail.com…This is a VERY CLEAN boat with LOW HOURS and lots of DESIRABLE OPTIONS that represents a TREMENDOUS VALUE OVER BUYING NEW. The Silverton Express is a great all -in-one package. It provides sleeping accommodations for 6, a complete galley, and a spacious cockpit area for relaxing and entertaining. When you are at the beach, there is even a transom shower to rinse of with before coming aboard again. The versatility of this boat is a great point. You can cruise, swim and entertain all in the same day. The cockpit and cabin designs allow for comfortable seating inside as well. Plus if it is too hot or too cold for you outside just turn on your heat or Air conditioning. This Silverton 310 is ready for you. This is a clean, boat that is nicely equipped.Comes with newer canvas,bellows,spacious layout. It is a great opportunity for a significant savings over buying new. Boat owner is motivated to sell!